The Washington Nationals now have a winning record with this win and move above .500. They crushed the Phillies behind a 6.0 inning shutout by Jeremy Hellickson. The final score in this game was 15-1. With this win, the Nationals have now won two consecutive series as they head back home with a rested bullpen as they take advantage of a much needed day-off tomorrow. With the huge lead, Trevor Rosenthal got to pitch the 9th inning, and he got 3 outs while only giving up 1 run. He now goes forward with a 72.00 which is a lot better than the infinity ERA or the 189.00 ERA he had after he recorded his first out of 2019 on a strikeout. 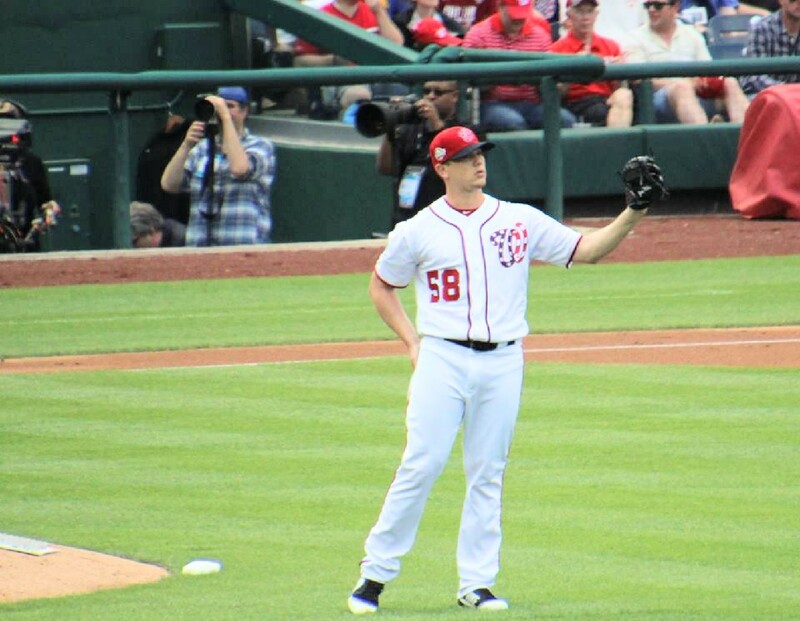 The Nationals offense went on the attack early with 3 runs in the first inning off of Nick Pivetta, and they knocked him out of the game early. The Nationals amassed 17 hits and 6 walks, and if the Official Scorer makes the right call, Brian Dozier should have 4 hits in the game instead of the three that he was credited with after Jean Segura made a spinning throw on a grounder up the middle that was ruled an error. Matt Adams got his first 2 hits of the season and should have had more if not for the wind blowing in which kept him from a grand slam. Adams finished with 4 RBIs in the game and took some great swings. The star of the game was certainly Jeremy Hellickson who not only threw the 6.0 inning shutout but also dazzled with the glove and the bat. Hellickson showed off his athletic talents in all facets of the game. By shutting down the Phillies, the fans went from silence to booing their players. The attendance was announced at 30,805 but the stadium was half empty at first pitch like it was on Monday. By the time the score was 15-0 the Phillies fans remaining numbered in the 100’s. It was another reminder of a fanbase built on frontrunner attitudes. If there was a negative in the game, it was Tony Sipp was pulled with tightness in his left throwing shoulder. This is something to keep an eye on, and to see if a roster move needs to be made. On the season, the Nationals have now completed a 6-game split with the Mets, and another 5 games with the Phillies where the Nationals are up 3-to-2 in the season series. The Nationals will start a three game weekend series with the Pirates in Nats Park starting on Friday with Patrick Corbin on the mound.